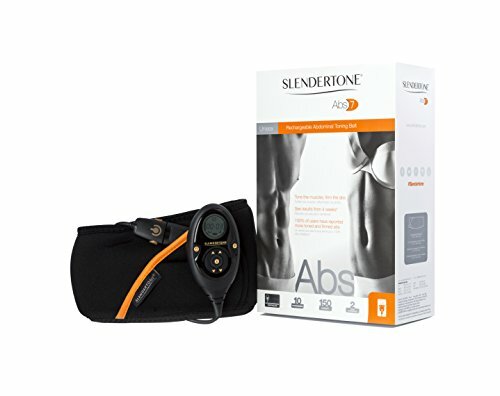 Slendertone Abs7 Abs Toning Belt Review. The Ultimate EMS Tech Belt? Summary: Slendertone has been at the cutting edge of EMS technology for years. The Abs7 is their current flagship Ab toning belt. This works using electric currents to stimulate muscle contractions. If you have any doubt that ‘Electrical Muscle Stimulation’ works, then I recommend checking the buyer feedback for belts and accessories in the Slendertone range. 10,000’s of people have already benefited! The Abs7 has a state of the art controller and belt. It is not much more expensive than previous products – and is fully rechargeable. Check out the full gallery and buyer feedback on this dedicated amazon.co.uk product page now! You will receive 2 main components when you order the Abs7. Firstly, the controller. This is rechargeable (you do not need to be ‘plugged in’ while using it). This controller works with all the recent Slendertone products. If you have success with the abs belt, you will not need to shell out again for a separate controller for the Bottom Toner or Arms / Biceps Toner. Second is the belt itself. This attaches with Velcro, and will fit a wide range of waist sizes – from 27 inches, right up to 47 inches. On the inside of this are pads which deliver the tiny electrical stimulations. These will need to be replaced after 30 or so uses. All abs belts need new pads to remain effective – you’ll use gel between your stomach and the pads to help conduct the electric current. One area where Slendertone stay ahead of the competition is in their electronics. The Abs7 is capable of automatically progressing you through the different levels – using their ‘intelligent training system’. This includes a mix of passive and active programs. The active ones are for use while you are working out, the passive ones while you are at rest. As well as the 10 different automatic programs, there are 150 intensity levels. Keep in mind that no EMS belt will give instant results when checking the comments on any of these products. You always get some 1-star comments from individuals that expected a 6-pack after 3 days. With this in mind the consensus is positive. At the time of writing this belt has a solid 4.2 stars (excellent for the category), and a general consensus that; a) it works, and b) the effects are visible fairly quickly. The quality of the product did come in for praise. This is the key reason that many people choose Slendertone over the unknown brands / copies. Slendertone’s customer service also came in for some individual praise. I have a whole page that looks at how and why these products work. To summarize, they will work for most people – though are not a ‘miracle cure’. If you have excess fat around your stomach area, I recommend shifting this before you buy an abs toning belt. This prevents the electrical stimulation from getting to the muscles – dampening the effect. If you stick to a healthy diet, work out and then add an abs belt to the mix, then the results can be very positive! What I like best about this product is that the controller works with all Slendertone’s latest products. This could save a lot of cash if you want to tone your bum and arms as well as that tum. The Abs7 has excellent feedback, and is not that much more expensive than previous generations. Add in the mix of active / passive programs, 150 levels and that famous Slendertone service – and you have a winning combination. Check out the feedback for yourself (along with the latest discount) on this dedicated amazon.co.uk product page.